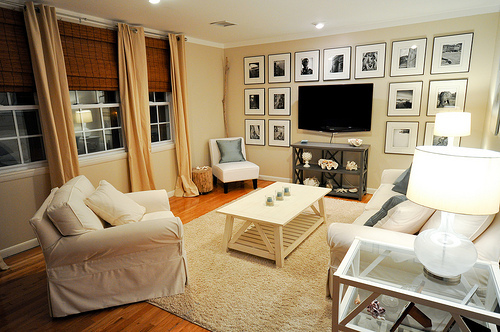 I can't stand it when the TV is the focal point of the family room. I know, I know...it often is the literal focal point because that's what you're looking at most of the time you're in the room at the end of a long day. But can't that wall somehow look nicer??? Often times our builder basic houses have layouts where there are 2 huge blank walls across from each other - one wall for the couch and one wall for the TV stand - and then the other walls are occupied by windows, doors, or walkways to other parts of the house. It leaves very little flexibility in the layout of furniture, huh? It can be frustrating, but hey, sometimes we just gotta work with it...especially with our limited budget. Being in a rental home I have very little leeway when it comes to painting walls or putting holes in the wall. I refuse to keep my walls entirely bare, but I do have to restrain myself...which is so very hard to do. I have our TV on our (admittedly) cool TV stand pushed up against one of our (very beige) walls in the family room. While the TV is rather large (47", I think? ), it still left the wall looking very blah and boring. So, I added some tall candle holders to flank the TV and a few accessories...a little better, I guess. Random rant: Did I mention that it's VERY hard to accessorize a home with a 12-month-old? Everything has to be padded or totally out of reach between the floor and 3 feet up...oh, the (welcome) challenges. Three 12"x12" frames 50% off! Stack of 12"x12" scrapbook paper 50% off! 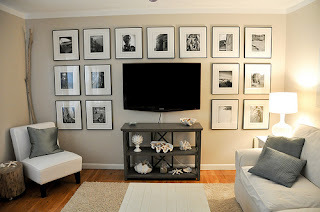 I thought to myself, "Huh, how about I add some visual interest and some color by placing three framed prints above the TV?" I decided to give it a whirl, at least it was inexpensive. All I had to do is pick out three of the papers that looked good with our colors and decor in the room, then pop them into the frames. No cutting required! I used a level, ruler, and a hammer+nails to hang them evenly. What do you think?